Targeting the far side turns this mission into a riskier and more complex venture than its predecessor, Chang’e-3 – which touched down in the Moon’s Mare Imbrium region in 2013. 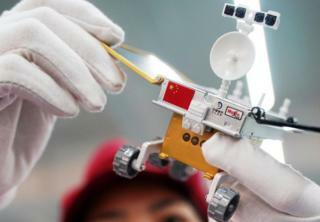 But China’s latest moon shot will pave the way for the country to deliver samples of lunar rock and dust to Earth. But the far side has a thicker, older crust that is pocked with more craters. There are also very few of the “mare” – dark basaltic “seas” created by lava flows – that are evident on the near side. The Von Kármán crater is located within a much larger feature – the South Pole-Aitken (SPA) Basin – thought to have been formed by a giant impact early in the Moon’s history. “This huge structure is over 2,500km in diameter and 13km deep, one of the largest impact craters in the Solar System and the largest, deepest and oldest basin on the Moon,” Prof Coates told me. And therein lies the scientific interest. The event responsible for carving out the SPA basin is thought to have been so powerful, it punched through the outer layer of the Moon, known as the crust, and down into the zone called the mantle. Researchers will want to train the instruments on any mantle rocks exposed by the calamity. “The in-situ composition information in particular will be hugely valuable in understanding the formation of the Moon,” Andrew Coates commented. Up until now, China has followed in the footsteps of US and Soviet missions, carefully building up its capabilities. But this mission marks a first for any space agency. The rugged character of the far side, with its undulating topography, poses particular challenges for landing the vehicles safely. Touching down on a jagged outcrop would spell instant mission failure – and be a significant setback for the Chinese exploration programme. The selection of the Von Kármán crater as the landing site owes much to the fact that it’s flatter than any spot in the South Pole-Aitken basin, according to Chinese scientists. The descent to the lunar surface is split into six phases. The first three – initial deceleration, quick attitude and reorientation adjustment, and approach – will be controlled from Earth. For the final three – hovering, hazard avoidance, and slow descent – the lander will take over, assuming autonomous control. The lander will also carry a 3kg (6.6lb) container with potato and arabidopsis plant seeds – as well as silkworm eggs – to perform biological studies. The “lunar mini biosphere” experiment was designed by 28 Chinese universities.